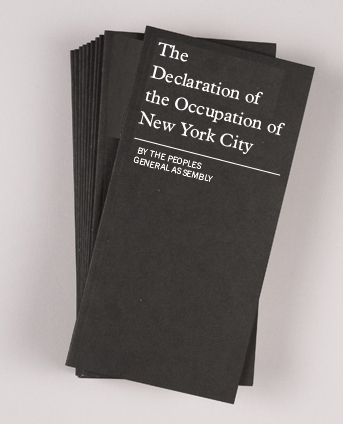 Help us print the People’s Declaration of the Occupation of Wall Street on 10,000 booklets by donating at THIS LINK. Please help The Sparrow Project print tens of thousands of pocket-sized booklets of the first declaration of the Occupy Wall Street movement. We have access to a terrific offset printer, recycled paper, and soy inks, but we need donations from people like you in order to make this happen! Please consider donating whatever you can by clicking the donate button below. If you cannot afford to donate please consider sharing this post with others. We will print and distribute the declaration to the cities nationwide that are participating in the campaign. The following is the first (rough draft) declaration of the People’s General Assembly at Liberty Square in it’s entirety as transcribed and edited by Ryan Hoffman, Lex Rendon and the Call to Action Working Group. Let us dispel the notion that the Occupy Wall Street movement is one without a message. We, the New York City General Assembly occupying Wall Street in Liberty Square, urge you to assert your power. Exercise your right to peaceably assemble; occupy public space; create a process to address the problems we face, and generate solutions accessible to everyone. To all communities that take action and form groups in the spirit of direct democracy, we offer support, documentation, and all of the resources at our disposal. Tagged declaration, donate, general assembly, occupy wall street, printing, video.